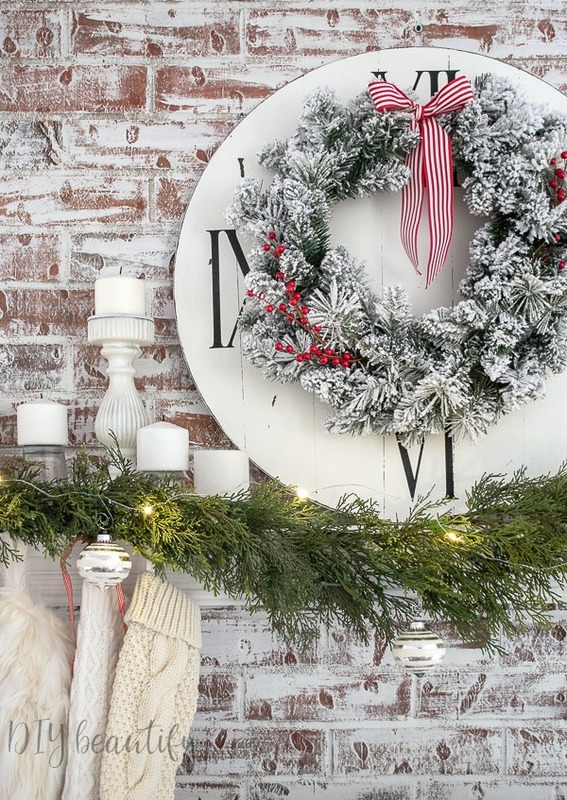 Sharing a simple, budget-friendly neutral Christmas mantle that is full of texture, style and oozes Christmas spirit! Well hi there! I hope you've come for some Christmas inspiration because today's post is full of it! In fact, all week will be full of Christmas ideas for you! 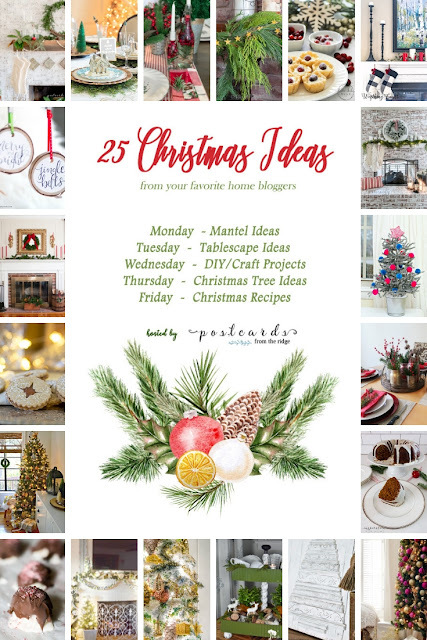 I am delighted to join Angie from Postcards from the Ridge and 24 other bloggers on this Christmas Ideas Tour to share our Christmas decorating ideas with you all week! We've got tablescapes, DIY projects, Christmas trees and holiday recipes coming your way! Today is the first stop on the tour and the focus is Christmas Mantles. When I'm decorating my mantle, I always remove everything first and give it a good dusting. Then I start layering. Ah, so much better! It doesn't take much! I tacked a cedar garland along the front of the mantle using some tiny nails to hold it in place and added a string of fairy lights. I hung just a couple frosted ornaments along the garland using my favorite new ornament hooks that are beautiful as well as functional. A variety of white candles were added next, all staggered in height. I elevated some shorter ones by flipping over glass votive holders and setting the candle on top. Let's talking stockings for a minute. These are not our traditional family stockings...those ones are all different sizes and shapes and patterns and colors and I put them up on Christmas Eve. I wanted a set of stockings that were neutral and used just for decor. I found these cable knit stockings on Amazon; they come in various colors and sizes and were very inexpensive. I also used a pair of white sweater stockings that I made a couple years ago using an XL sweater I thrifted. And finally, a furry stocking to add some more texture. I actually found this one on Ebay. I love that they're all different in size and color, but they work together because they're all neutral. I used these mini 3M command hooks to hang them. All the "business stuff" is hidden by the garland! I put up three very fun trees this year. You can see my blue and white dining room tree here. It's a flocked tree full of handmade ornaments and real transferware teacups and saucers and ironstone pitchers. I'll be sharing more details about the other two shortly, but if you follow me on Instagram, you can find sneak peeks there. 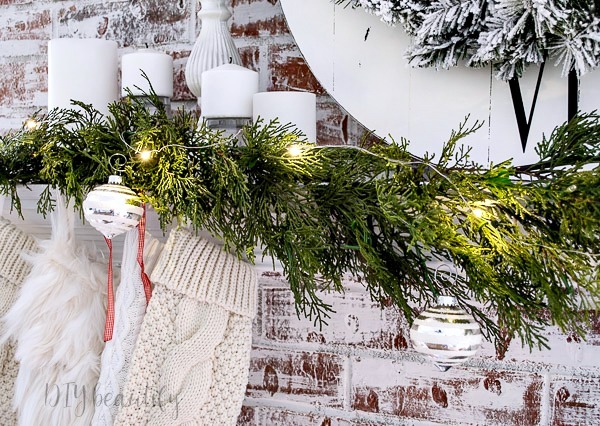 Now it's time to see all the Christmas ideas from these talented home bloggers. Here's the tour lineup for the week. Be sure to visit everyone for wonderful Christmas ideas for the whole house. The links for each topic are below the images. I'd love to know how we inspired you this year! Just beautiful! I especially love the lush garland and the mix of different stockings! Your mantel looks so pretty! 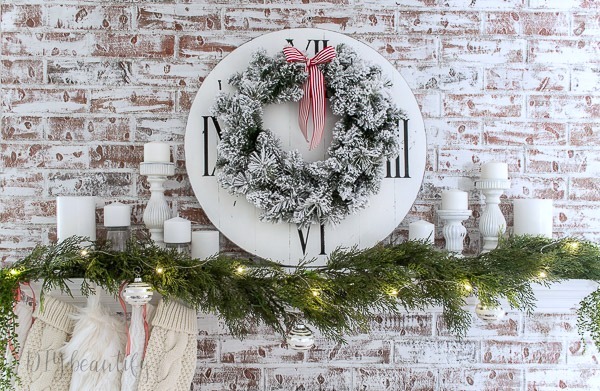 I love how you used a white and green color palette and how you layered your wreath on your faux clock. I look forward to seeing more of your Christmas decor this holiday season. Thanks Angie, I always love touring with you!! You are so sweet, as always!! Thank you! I hope your holidays are special!! 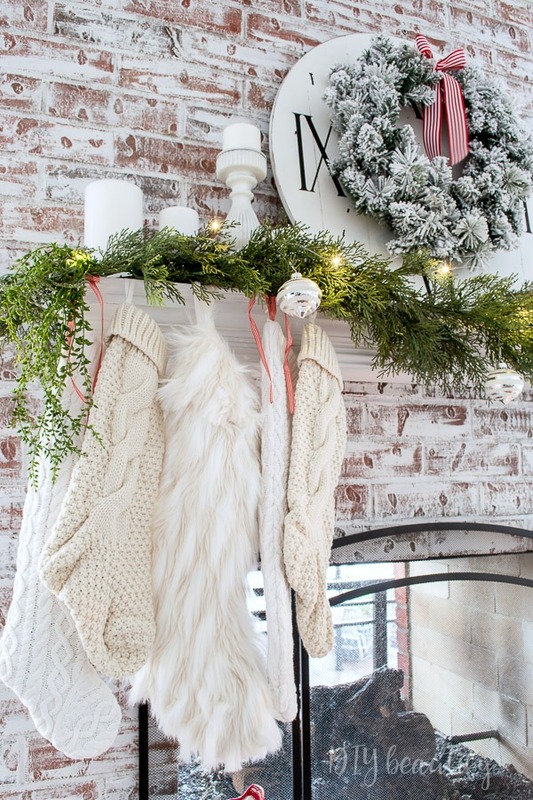 Those stockings make your mantel display look so cozy! Love your neutral decor but you were right about adding a touch of red with the berries! And I spy one of your beautiful trees in the background! Looking forward to seeing more! I love your textural mix of stockings, all in whites! 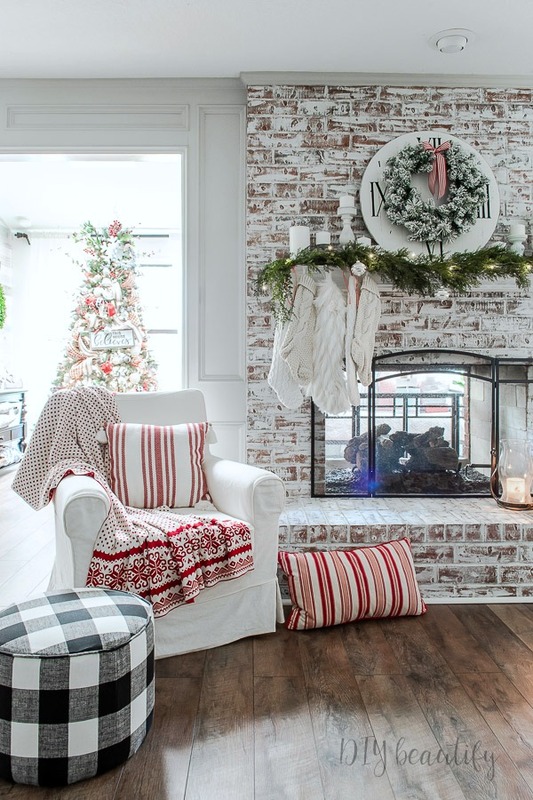 How fun to have a freshly white fireplace to decorate; changes are always good inspiration! 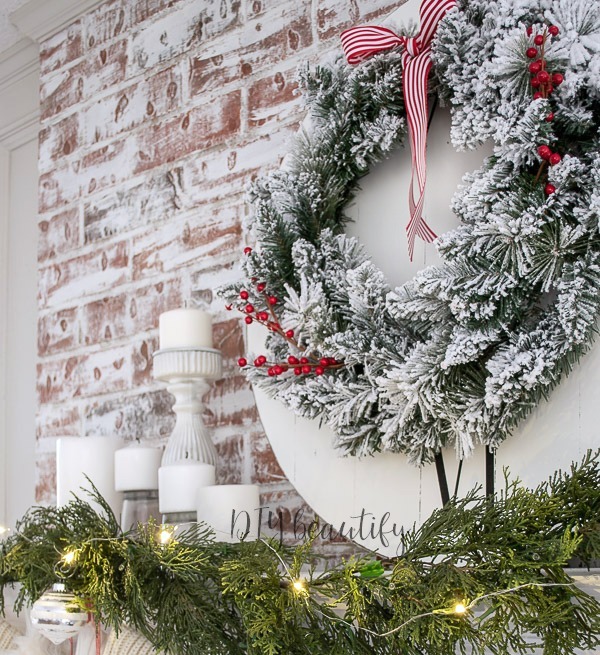 You're right, those little pops of red berries in the wreath make such a difference! Your mantle is beautiful and I love the mix of different stockings! So pretty! I love your stocking collection! Absolutely gorgeous. I don't think my decor has ever been the same two years in a row either. I am also doing flocked trees and garland this year and red berries just look so good against the flock. Thank you, yes I love the bright red berries against the white!! I love your mantel Cindy. The white candles and greenery are perfect against the white brick. I also love your red and white touches! Thanks Kathy, I appreciate that!! I love your mantle! Especially adore the pops of red! Cindy, this is so beautiful. The neutral color palette with a pop of color works so well in your home and all the texture makes it. Thanks so much Kristi!! I hope you have a very merry Christmas!! 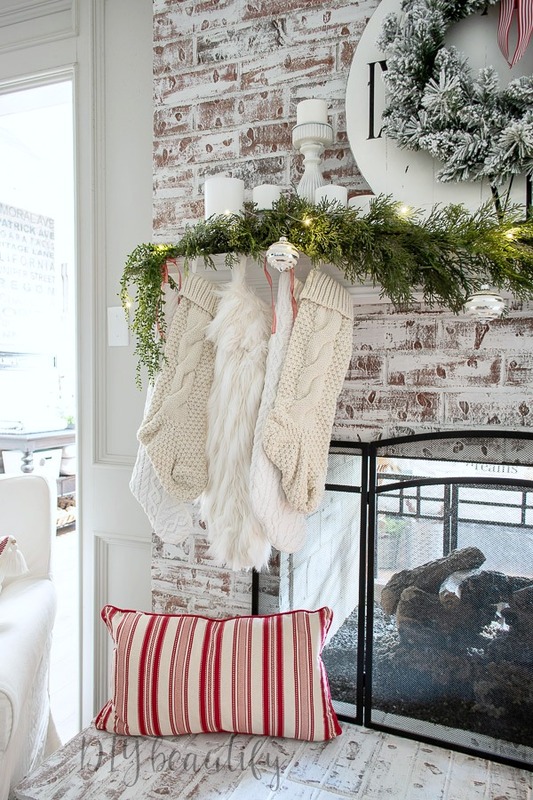 Your mantel is just beautiful and I LOVE your stockings with all the mixed textures! Hi Cindy, Think your whitewashed mantle is just lovely...and that it's a see through fireplace! so fun! 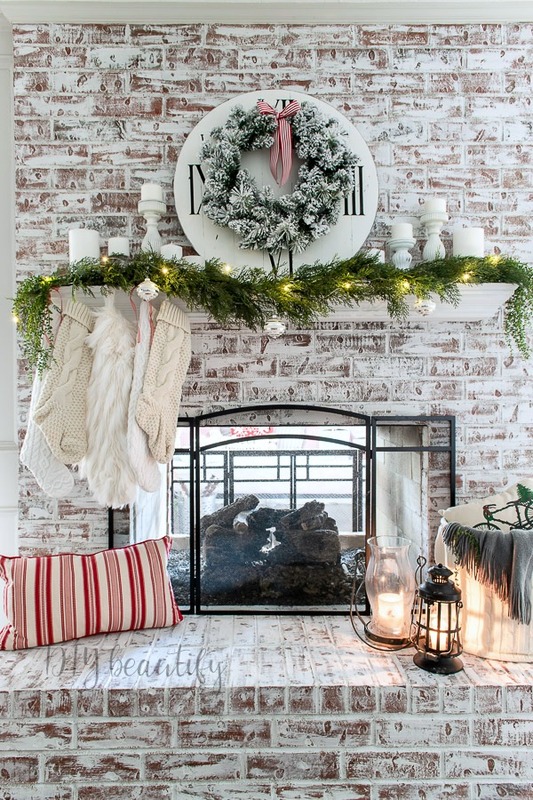 The 'fresh' feel of the mantle is perfect for this hectic time of the year. Thanks for sharing. Glad to join you on this blog tour. Thank you so much Lynn, i'm so happy to join you on this tour! Such a beautiful mantel, Cindy. I'm loving your whitewashed brick and the live greenery.